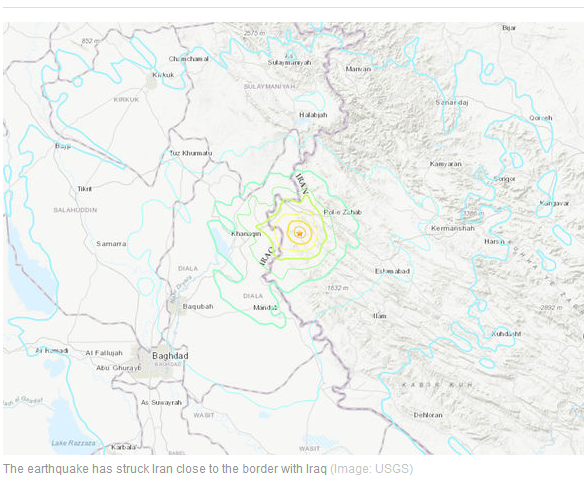 AN earthquake with a magnitude of 6.3 has struck western Iran close to the border with Iraq. Casualties are expected following the 6.3 magnitude quake on Sunday. The earthquake was at a depth of 65 kilometres (40 miles) and struck 114 km (70 miles) northwest of the city of Ilam. Iranian rescue teams have been sent to the area, according to state television. No fatalities have been reported so far, it added. The quake’s tremors were felt from as far away as Iraq’s capital Baghdad, according to the Iraqi Geological Survey. It was also felt in in Erbil in the Kurdistan region. Iraq's interior ministry said no damage or casualties had been reported in Baghdad. It comes a year after a deadly earthquake hit the area in November 2017 killing hundreds of people and causing widespread damage.